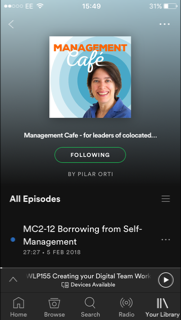 In this episode, Pilar talks to Sam Mednick, fellow podcaster, executive coach and audacious journalist. Sam introduces herself. She's an audacious journalists and also a member of the Happy Melly team. Sam talks about what it's like to work in Happy Melly One. It seems difficult to separate happiness at work from happiness in life in general. It's ok now to admit that what happens in life affects our work and viceversa. What makes trust possible in this virtual team? Sam talks about sharing values and having honest conversations and touching base with each other on video. Pilar mentions "Faster, Smarter, Better" by Charles Duhigg and psychological safety. Executive Coaching and current challenges executives face. The nature of coaching, it need not be remedial. Check out Sam's website: Blueprint Coaching. Sam's "appointment with herself". Why does she do it and what is this "high-level meeting"? What drives Sam to conflict zones? What does she actually do when she gets there? How does she find the stories? How does Sam organise her time to manage to juggle all the different things she does? Sam's journey through radio and how it's different to podcasting. Check out Serious About Happiness, the podcast Sam hosts. Feedback in virtual teams - "permission" to give and ask for feedback. Are we afraid to ask for feedback? Sam tells about her experience getting feedback in Happy Melly One.